Paintbot is an autonomous painting robot that can move freely inside construction zones or outside to paint construction objects. The paintbot uses multiple sensors to recognize its environment perform its wall painting task safe and efficiently. The Paintbot wil revolutionize how painting is done during large scale construction projects. The sensors will show the color of the wall, ceiling and the floor. It can scan the wall to see where it still has to paint or scan it for color abnormalities (where another paint layer is needed). Besides painting walls, floors and ceilings the potential of the paintbot is limitless. In the future it could also become capable of painting at road constructions (used for road signs and road marks). To do this, it will only need to take advantage of additional GPS. The paintbot is an electrical powered system. The robot arms are driven by electrical motors in the axes. The wheels can all be rotated and steered separately by the movement control system. The paintbot carry’s two paint buckets. The paint buckets can have identical or different colors. When different colors are used, the paintbot can make gradients or use different colors. 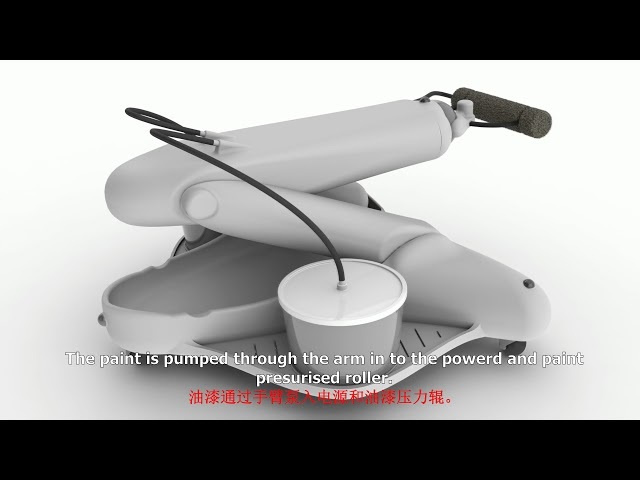 The pump in the mid-section of the paint robot will pump paint in to the roller. The paintbot can transform in to many shapes. This capability allows the paintbot to do many painting tasks. The paintbot can paint walls, ceilings and floors. The paintbot would typically be used to primer and paint new houses or buildings as the last stage of the building process. The construction company would import drawings of the building in to the paintbot and let it autonomous drive through the building and paint the walls/ceilings. The positioning of the paintbot is done by 3 powered wheels. The driving orientation of every wheel is controlled by a unique stepper motor. The stepper motors for driving direction can be controlled separately, to allow the paintbot to even rotate around its own axis and maneuver perfectly in to position. Al three wheels have their own stepper motor to power the wheel. This combination results in a total of 6 speed/position controlled motors for the positioning. The AI position recognition consists of multiple layers. Location reconstruction of the paintbot within its environment. Paint task to paint route efficiency. optimizing positioning for most effective paint arm strokes. The Paintbot has 3 3d cameras with distance recognition. The paintbot will compare the visual data to the map of the location (with integrated paint plan). Besides the positioning, the cameras are also used to recognize objects and humans. The paint arm hardware can be split up in to two sections. The stroke motors are used to place the painter head/roller in to the right position. The exact angle and distance to the wall is measured with a lidar sweep. The roller alignment roller motors are used to align the roller with the movement vector. The total movement area is large enough to reach in to corners. The eventual end results as the centerpoint of mass must remain within the footprint, to prevent falling over.